The Virtual Paintout location for October was Lima, Peru. I really enjoy participating in the Virtual Paintout every month, which I've done for over a year now. Bill Guffey selects the location for the month. It can be anywhere the Google Street View vehicles have covered. Artists use Google Street View to find a virtual location to paint, just like on a non-virtual paint-out. Bill has selected locations all over the world. I'm always excited to see the location I'll be scouting for my views to paint. I know I'll never get to see these beautiful countries and cities in person. Since the end of the month always sneaks up on me, I painted a small watercolor and a small gouache to finish by the deadline. It seems the gouache pieces are hard to scan for the correct colors so I tried a photo which I think is more true to the actual color. Can't wait to see what Bill has chosen for November! 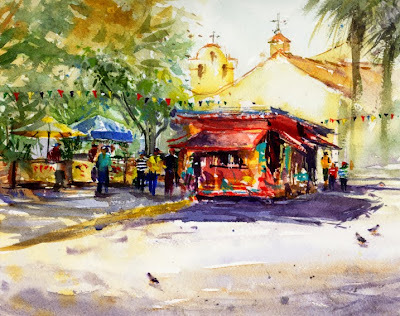 I've been lucky to be able to paint with two plein air groups recently at Olvera Street. It's in the oldest part of downtown Los Angeles and naturally part of its history. The Avila Adobe, 1818, the oldest residence still standing in Los Angeles is there. During the first half of the 1900s Olvera Street went through some tough times, but has been preserved and restored, designated a state historic monument in 1953. Olvera Street is really a named alley, not a true street. It's a tourist attraction today, the historic, old brick buildings lining the very colorful vendor stands filled with Mexican goodies for sale. 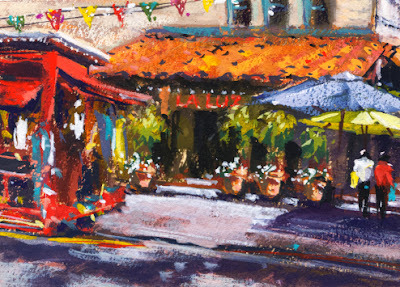 I was excited to see Olvera Street on the paint-out schedules. What a fun and picturesque walk down the street past all the vendor's offerings, under the old grapevine. But since it's such a big tourist attraction (complete with tourist buses and school buses) I was a little concerned about painting there. I don't take up much space with my watercolor gear so I was open to seeing where, and what, I could paint. The Plaza de Los Angeles is next to Olvera Street and turned out to be the best place to paint. There are a few of the colorful vendor stands in the plaza area. 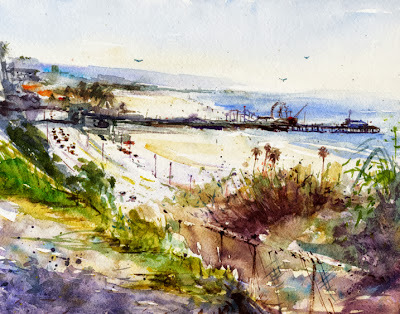 On one paint-out I chose to paint a watercolor view to the south, and then the opposite view in gouache the next visit. Visiting the end of October means lots of festivities for the Day of the Dead Mexican holiday. On Saturday the plaza had music and dancing for us to enjoy while painting. One of my most memorable paint-outs! 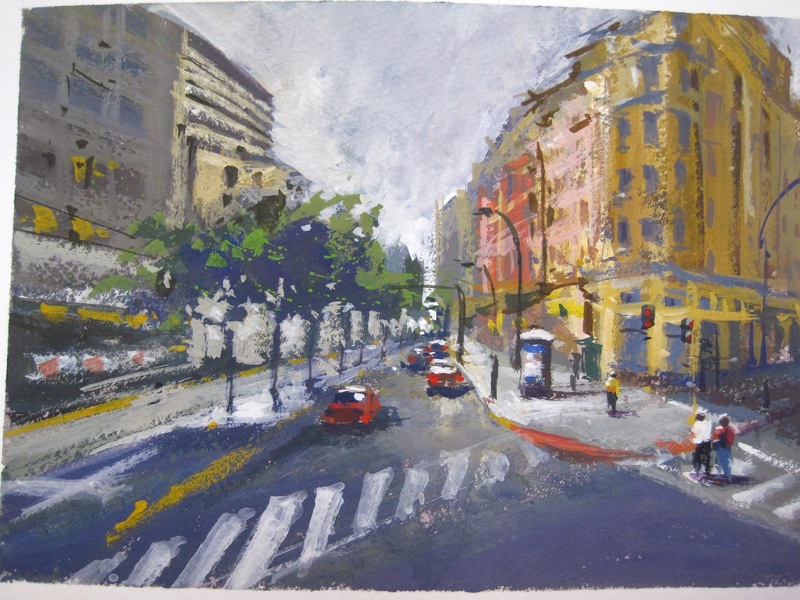 I've been working with gouache (opaque watercolor) for almost a year and am still learning of course. For the plein air paint-outs I go on, sometimes I feel gouache will work better for what I have in mind than transparent watercolor. 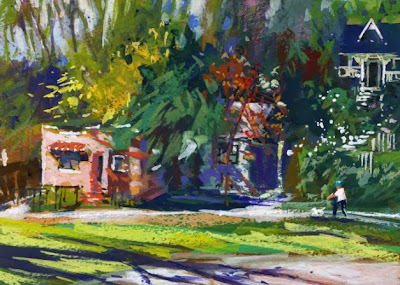 On many plein air outings in the past few months I've painted a gouache piece in addition to my watercolor. While my transparent watercolor washes are drying I can work on a smaller gouache. Or, sometimes the time I have to spend is short so I just try a gouache. 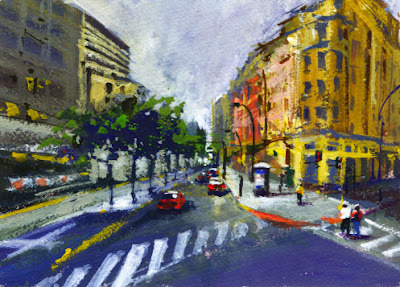 The paint dries faster than watercolor and I paint at a smaller size, 5x7", so far. I have two recent gouache pieces to share. The first I painted last Saturday with the group on Avenue 64 in Highland Park, a neighborhood of Los Angeles. 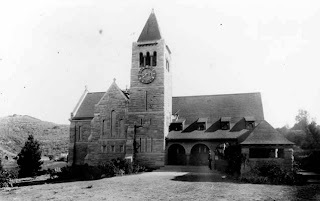 Our location was the Church of the Angels, 1889, but the hillside across the street from the church caught my eye. I thought the houses and trees might be fun to try in gouache as I wasn't feeling up to the church's architecture. I found an old photo of the church online which shows the hillside I painted before it was covered with homes. 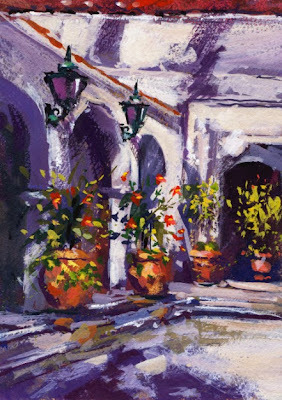 Another recent paint-out was at the Pasadena Playhouse, 1925, built in the Spanish Colonial Revival style. Finding some shade the day we were there was a challenge so I decided to use gouache to paint my view of the courtyard arches and hibiscus from some shaded steps. I'll be back at both of these locations to paint other views! This week was full of exciting paint-out locations with the groups I go out with. On Friday we car-pooled west for some ocean scenery. We met in Santa Monica at Palisades Park. The park stretches for a mile and a half along a bluff overlooking the Pacific. It was a beautiful day with stunning views of the beach from Malibu to the Santa Monica pier. The park attracts visitors from everywhere. It's a great place for walking, exercising, biking, watching the sunset, and of course scenic views for painters. We had six in our group that day, and there happened to be a plein air oil painting class meeting there too. I thought it was fun to have so many painters working there. I chose a view next to a walkway down to the beach where I could also see the pier. I wanted to include the pier with its ferris wheel. It's spectacular at night when it's lit but I haven't seen it in person. Another visit would be great! Some of the plein air oil class painting near me. What a beautiful morning for a plein air paint-out. We met at Deukmejian Wilderness Park in La Crescenta, California. I hadn't visited the park before and was surprised to see a large and stunning two-story stone barn. 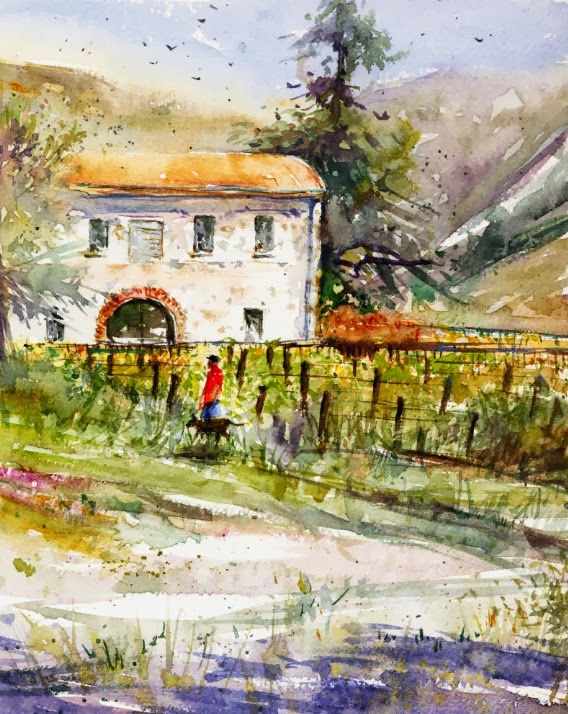 The French Le Mesnager family built the barn in 1914, using local river rock, on land they acquired in 1898. 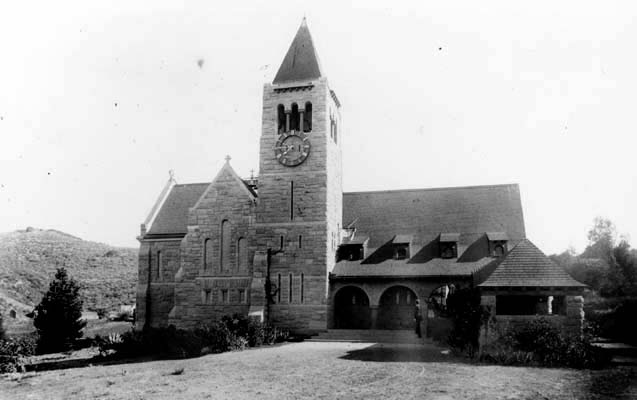 It was used as a stable and grape storage for their downtown Los Angeles winery. There is still a small vineyard producing a small amount of wine yearly which is tended by the Stonebarn Vineyard Conservancy. Our painting group had some wonderful views to consider. I found some shade with a nice view of the barn and vineyard. The park is located way up a hill so it's pretty quiet with mostly neighbors out walking dogs or hiking. 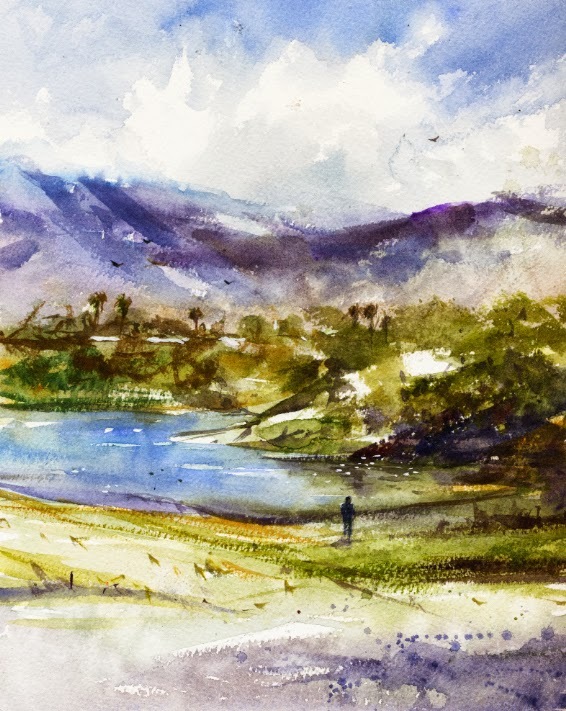 I had to include a dog walker in my watercolor. There are also some spectacular views from the hillside of the valley and mountains. I'm ready for a return visit! 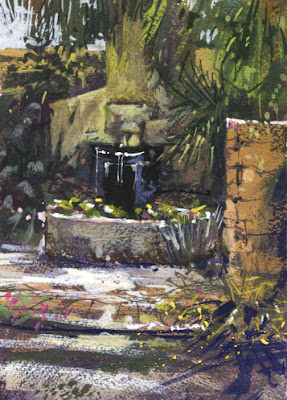 One of the plein air painting groups I enjoy going out with holds quarterly planning sessions at the local Arboretum. We all contribute thoughts and plan the paint-outs for the upcoming months. Our planning meeting at the start of the summer was in July and our meeting to plan fall paint-outs was last month. Since these meetings usually take an hour or so, I only have time to paint a small, 5x7" gouache piece before our finishing time when we meet back at the Peacock Cafe to share our work. In July when I arrived at the Arboretum a peahen was on the lawn in the parking lot with her three chicks. They were attracting a lot of photographers and my photo is below. 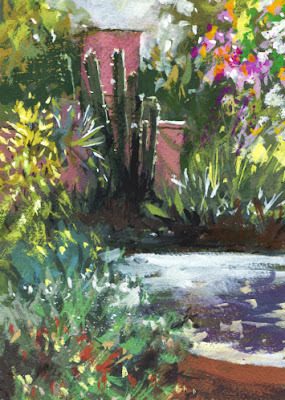 After our planning session I decided to paint in one of the demonstration garden areas. They have small patios of ideas for home gardens. I chose a view of the very pretty raised lily pond. When we met for our latest planning meeting in September I was surprised to see a peahen with her adolescent sized chick standing on a table in the cafe patio (below). Probably not the same family I saw in July but I was happy to see them. I chose another nearby view in the desert display garden because I could see the pink blooms of a silk floss tree. These trees have thorns on their trunks and large pink flowers which the hummingbirds loved. There was also a pink plaster chimney with some tall cacti growing against it to make the scene. There are a lot of parks to paint that I haven't been to yet with the plein air groups. That's pretty exciting! One I'd been looking forward to was Peck Road Water Conservation Park. It's not too far from me and has a lake. There is even a fishing club since the lake is stocked with trout and catfish. Online reading revealed that the park was converted from an old gravel pit. The conversion is still in progress because there was a lot of construction and landscape work going on the day we were there to paint. The morning scheduled for the paint-out was a little overcast and the sky was filled with some terrific clouds. Great for trying to paint. I need more work on clouds. The clouds were hanging over the mountains which we had a great view of from the park. I loved seeing all the birds coming and going from the lake. 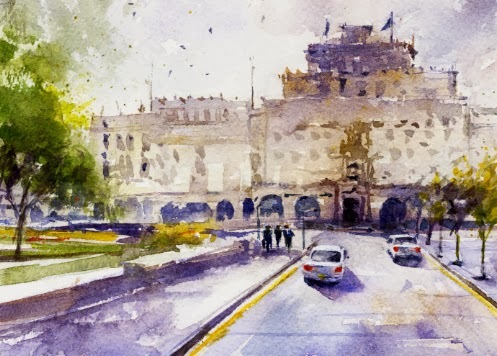 What a wonderful view to try in watercolor. I also had time for a small gouache and considered painting some of the construction equipment, but settled on the view to my right. There were some fellow painters and some industrial buildings. By the time I needed them, the artists had packed up and I thought my small painting was OK, and busy enough, without adding them. We heard roosters all morning and I'll look for them on my next visit. Yes, Flying A an old gas station brand, now defunct. In 1966 Flying A products and gas stations were rebranded to Phillips 66. But this blog is about watercolors! 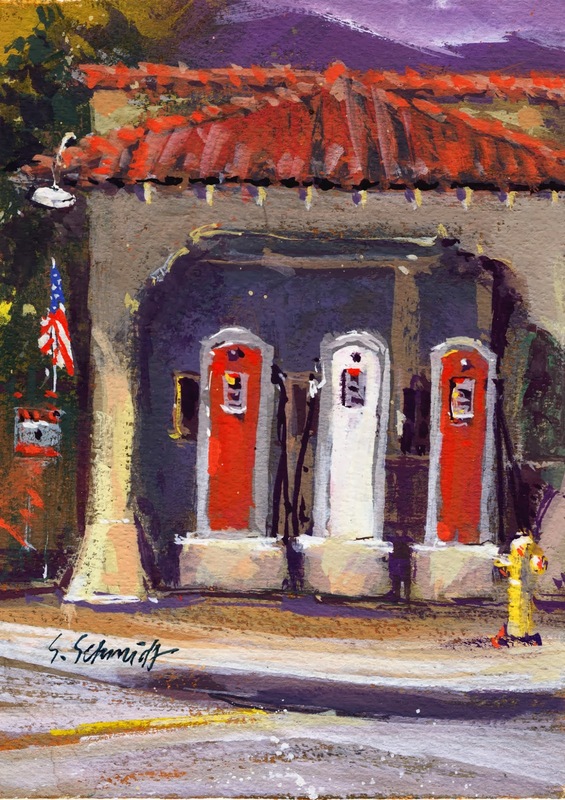 We plein air painters are lucky to have an old Flying A service station preserved along old Route 66 in Monrovia, California. The three old gas pumps are a reminder of activity many years ago. I've been at the gas station corner to paint with two groups this summer. As you see in my photo, there isn't any shade nearby. 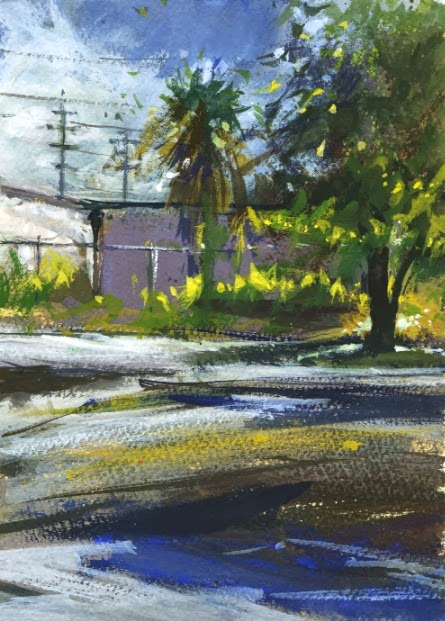 On my first paint-out there, I found a spot across the street under a tree to try a small gouache piece. I was happy to have a flag, and a yellow fire hydrant to move into the view. The next time our group was there it was starting off to be such a hot day that most painters were leaving about the time I arrived. I didn't want to paint alone and left too. I'll try a different view next time we're there. The owner operates a car repair business on the west side of the property. I'll give him a print of my painting.